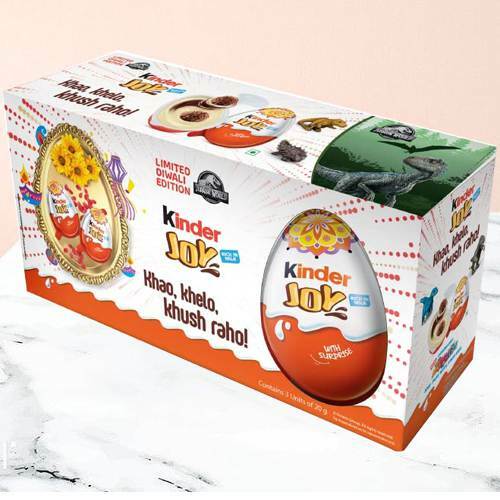 Extraordinary Kinder Joy Chocolates Pack 6 Pcs. Online delivery of best wishes along with this Extraordinary Kinder Joy Chocolates Pack 6 Pcs. for your dear ones. This lovely Gift will definitely win the heart of recipients. Flowers Delivery Krishnagiri, Send sweets Gajraula, Wedding Cake Kapurthala, Diwali Mithai Shimoga, Send Flowers and Gifts to Vasco, Online Shop Agra, Flower to Devangere, New Year Flowers Surat , Fresh Fruits Dehradun, Send Gift Hanumangarh, Dry Fruits to Chandrapur, Birthday Delivery Quilon, Sending to Kurukshetra, Flower shop Anand, Bhiwadi Online Cake Delivery.